After a long string of “traditional” Couchsurfing with strangers or not finding a host at all, Javier reminded me how fun it was to Couchsurf with people that I already knew and discover the place and their culture through them. Whilst there may not be as much discovery on the personal level given the fact that I already have met them before, this means that the initial feeling-my-way-around period doesn’t have to be incurred as heavily as with strangers and there is already some common ground to work with. So I was excited to be coming to Valencia, where I knew and had hosted a local Spaniard previously. With many of the previously hosted Couchsurfers that I have caught up with here in Europe, they had stayed with me quite recently or we had remained in touch somewhat persistently. However, with Vicente from Valencia, this wasn’t really the case. I found his Couchsurfing profile and it didn’t show too much activity since he had left my place in Adelaide. He had stayed with me more than two years earlier but had mentioned that I would be welcome with him anytime. Despite the fact that it seemed he didn’t use Couchsurfing too often any longer, I figured that a request would show up in his email inbox, which, hopefully, he did check more regularly. Sure enough, contact came with a response, but initially he was unsure if it would be possible. Whilst in Australia, he had traveled with his girlfriend, an Irish girl by the name of Gabrielle, who had also Couchsurfed with me during their stay. As it turns out, they had since become engaged, and Gabrielle’s sister was visiting town to help out with the wedding plans at the same timeframe that I was planning to come. Vicente seemed unsure if he would have the facilities or time to host me and I didn’t want to intrude so we came to a compromise – I would continue to look for other Couchsurfers and if I simply couldn’t find anyone then he agreed to help me out regardless. I genuinely searched with no results. Limited Internet availability meant that I didn’t search as thoroughly as perhaps I could have, and knowing the security of having a fallback option also probably caused me to become complacent. I didn’t want to interrupt any stressful times they may be having but I was quite keen to stay with them and meet them both again to reminisce. Ultimately I contacted Vicente again and told him of my situation and he agreed to help me out. Vicente didn’t live in Valencia proper, but instead in a small town on the outskirts called Aldaia. Aldaia was around a fifteen minute bus ride into the center of Valencia and this ride cost less to nothing so I actually quite enjoyed the opportunity of Couchsurfing in a smaller community where I found the people were more genuine. It also meant that Vicente and Gabrielle’s house was a lot larger than those I had stayed in elsewhere through Spain, where I had Couchsurfed in the city limits and space was more restricted. It was a pleasure to be able to see them both again and although it had been a long time without contact with either of them, it really did feel like yesterday that I had said goodbye to them in Adelaide. True to their word, Gabriella’s older sister Mary was in town helping with the arrangements and she was immediately friendly and smiling – an early indicator of Irish friendliness, perhaps. Gabriella had become quite competent at Spanish during her years there and so it was actually helpful having Mary there, who also had the need to speak English during the conversations. Revisiting people like Vicente and Gabrielle reminds me just how much I enjoyed hosting back in Adelaide and that nothing was wasted. People often asked if my frequent hosting episodes meant that I couldn’t spend as much time with certain guests or if I started to forget any of the Couchsurfers that I had hosted. But talking again with Vicente and Gabrielle, I was surprised at just how much I had remembered of their stay years before. Hundreds of Couchsurfers had come and gone in between, but I still remember the conversations we had had and which bar we went to one night. Vicente was an ideal person to introduce me to Valencian culture, which I found was surprisingly different to the standard Spanish. Valencia has it’s own language, Valencian, which is more derived from Catalan. Of course, I couldn’t tell the difference between Valencian, Catalan or Spanish. He happily introduced me to his friends when they came over to socialise and once took me to his local pub where almost every friday afternoon after work he and his buddies would have a few to celebrate the coming of the weekend. Valencia also has a fine tradition of food, and it’s here that the famous paella originates. Travel anywhere in Spain and you’ll find restaurants serving paella, most commonly with some seafood element of prawns or mussels, but the traditional Valencian paella is done with chicken. Vicente has become somewhat of a paella master and on the last day before Mary’s departure back to Ireland, he agreed to cook a paella for us all. 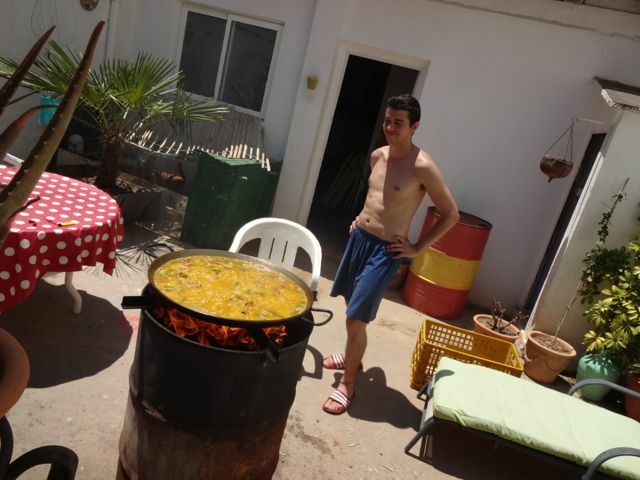 It was fascinating to see the process, cooking the paella in a large pan placed over a barrel acting as a barbecue. Although Vicente assured us that it wasn’t cooked perfectly to his liking, it tasted superb and my mouth waters as I write this thinking about it. Like all other Spaniards, Vicente was passionate about football and on my final night there we stayed up into the early hours of the morning watching the Confederations Cup Final between Spain and Brazil. Not the most prestigious tournament, there was never a great sense of seriousness but as is understandable, a win was the more preferable option. A few nights earlier we had watched a tense semi final against Italy where Spain became victors in the penalty shootout but the final was not to be, Brazil showing their class to come out easy victors, leading after a very early goal. Vicente stayed up until the end, despite knowing that the odds were very slim at half time. It’s this passion of football that engulfs the Spanish. One of the first Spanish I met on my travels through Spain told me that the country doesn’t have a whole lot going for it at the moment, and it’s people are in a very insecure state. Football is the one thing they can band together on and be proud about, and despite the loss in the final, it was clear that Vicente was still very proud of his nations abilities. A very enjoyable few days catching up with some old friends came to a close watching an amazing sunset over the lake Albufera. I hadn’t forgotten a minute of our initial encounter, and this was to ensure that I wouldn’t forget a minute of this one, either. Thanks a lot Mary! Travels are kicking along – I can’t write articles fast enough! I hope all is well and enjoy the upcoming wedding!